Whenever I hear statements like “we all know Korean skincare is the best in the world” I cringe. Big time. I don’t enjoy generalising and with skincare in particular, there are so many parts of the world (Japan, France and Australia to name a few) that take their skincare formulation game very seriously. However, what we do know about Korean skincare is that it comes with so many traditions, knowledge passed down for generations and lots of rituals on application techniques. Whenever we see Asian skincare, there are usually elements of brightening or whitening ingredients and herbs added to the products. Living in Dubai where so many nationalities are gathered and talking with friends of darker skin tones with hyperpigmentation, skincare that can brighten the skin seems to be sought after. On the other hand when I discuss this with some of my western friends, the feeling seems to be ambivalent; like lightening products adds to some Michael Jackson-trend where the aim is to look lighter. I like the debate and personally feel this: I’ve got many western friends with light skin AND hyperpigmentation that absolutely love the whitening products coming out of the Korean market just as much as anyone else. It is all a matter of personal preferences and skin goals really. 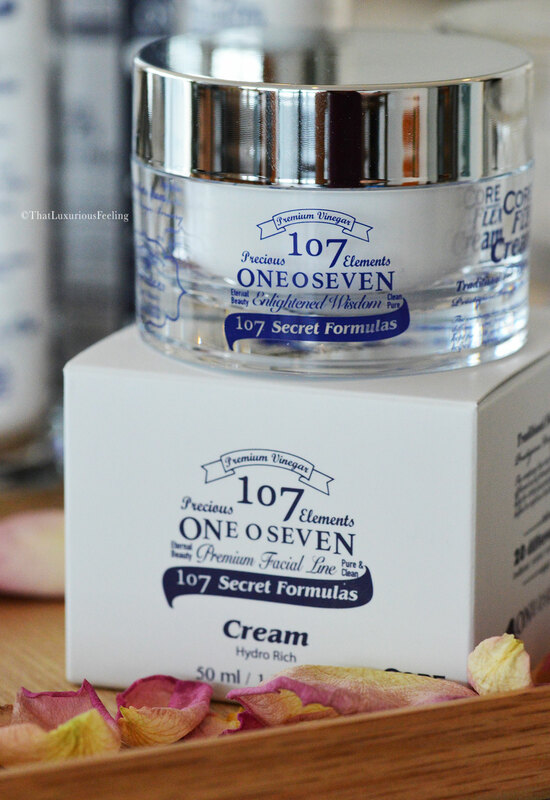 The reason for going on and on about this is simple: when I was approached to get the chance to try out the Korean brand 107 ONEOSEVEN I was jumping up and down with joy but I also knew I’d probably receive questions about if their products provide any lightening effect to the skin and my opinion in the matter. They do, and I approve! 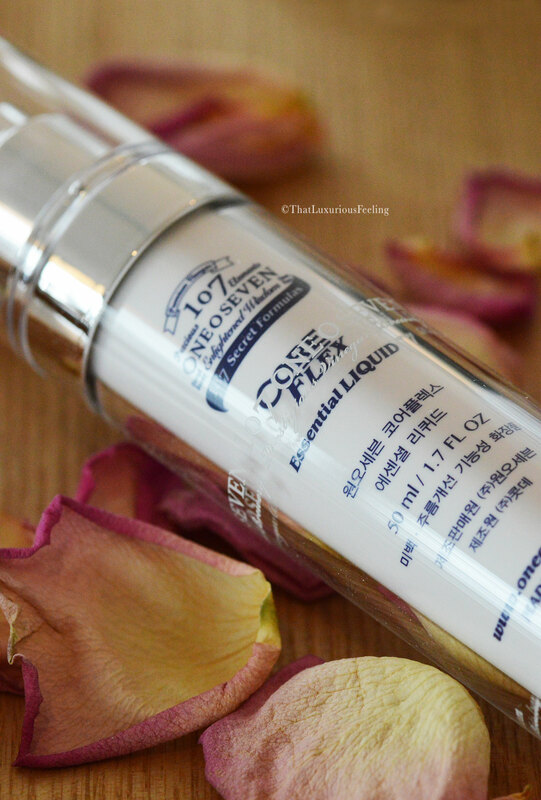 107 ONEOSEVEN is one of the more premium Korean skincare brands on the market; currently being very popular in the U.S as well. I never thought I’d get access to if but then I found out that a friend of mine, the lovely Lisa from our #beautycommunity actually stock them in her luxurious online store Bemused Korea for worldwide shipping! Hurrah! For the first time ever, I now have access to some of the most elegant and high-tech Korean brands to be shipped straight to my doorstep. Naturally, when Bemused Korea and 107 ONEOSEVEN gave me the chance to try out the scervice and range, I couldn’t resist. The package (so incredibly beautiful and personalised) arrived within just a few days without as much as a scratch on it and what impressed me the most was that it must have been shipped in a very professional way (maybe cooling temperatures?) because all of the products arrived in perfect condition and anyone who has ever ordered skincare to a warm climate zone knows it comes with its challenges. Lisa had generously picked out a routine for me, that she thought I might enjoy and benefit from. Let me tell you a little bit more about 107 ONEOSEVEN and show you the products! The brand is owned by Korea’s largest naturally fermented vinegar brewery called HANEGA. Heritage and DNA sits in the walls of the brewery as it is now headed by Pharmacist Okran Chung, who represents the 35th generation of her family business. That’s quite something. I’ll say it again: Heritage, history, knowledge and the brand DNA sits in the walls of the business. Ms. Okran Chung observed that her vinegar seemed to be able to help troubled skin and diminish skin ageing and so she decided to work with leading R&D to see if her vinegar could be used in a cosmetic range. 107 ONEOSEVEN was born with the main ingredient of high-quality naturally fermented vinegar combined with amino acids, nutrients, vitamins and other lovely ingredients. Premium vinegar detoxifies and regenerates the skin which makes it clear and restore its natural glow. Although on its 35th generation, the company still remains a family-owned business with a high ethos. They do work together with UHIC to help children in Tanzania and all of their vinegar is made from wheat that is produced completely free from agricultural chemicals and later on processed without the use of any preservatives of bleaches. You’ll get a crystal clear product from the start to the end. The first products by the brand that I started to notice on social media was their collection of soap bars. I’ve always been against using any kind of soap bars bought at the regular supermarket to wash my face with and must admit I was sceptical but intrigued by these alternatives. Would they work for my sensitive, dry and dehydrated skin? I was sent the Premium Black Soap and the Premium White Soap and they differs a little bit: while the black option contains 7 year old naturally fermented vinegar which naturally removes dead skin and clean out the pores without having any exfoliating, acid effect the white soap is made up of 5 year old precious traditional vinegar and over 20 oriental medicine herbs. Both contains Saccharomyces and Lactobacillius alongside Coconut Oil, Vitamin C, E, B1, B3, B5, B6, Iron and Copper. 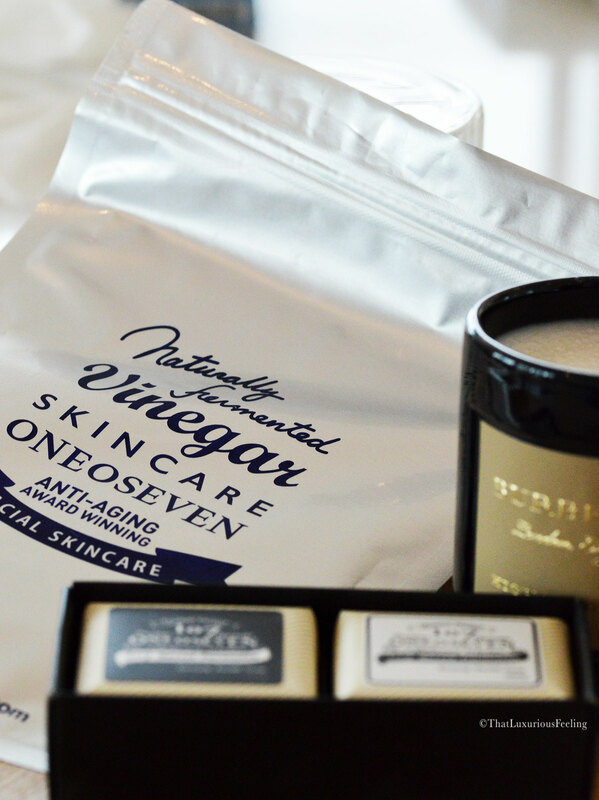 Said to brighten pigmentation, work to restore the moisture balance in the skin and unclog the pores with anti-inflammatory properties of the vinegar, the bar soaps are the cleansing foundation of the 107 ONEOSEVEN skincare regime. My thought on them both: The scent is fresh and exquisite. You’d never know that they contain vinegar! They are beautiful to look at and display and they lather up with a rich, soft foam. For my dry skin, they are still a bit too much to take as I need at least a double-cleanse if I’m wearing makeup and the soap leaves my skin feeling a little bit “too squeaky clean” for my liking. I think they are much more suitable for anyone with normal – or oily skin. From cleansing and onto skincare, starting with what I’d like to call The Magical Twins. This is the thing. 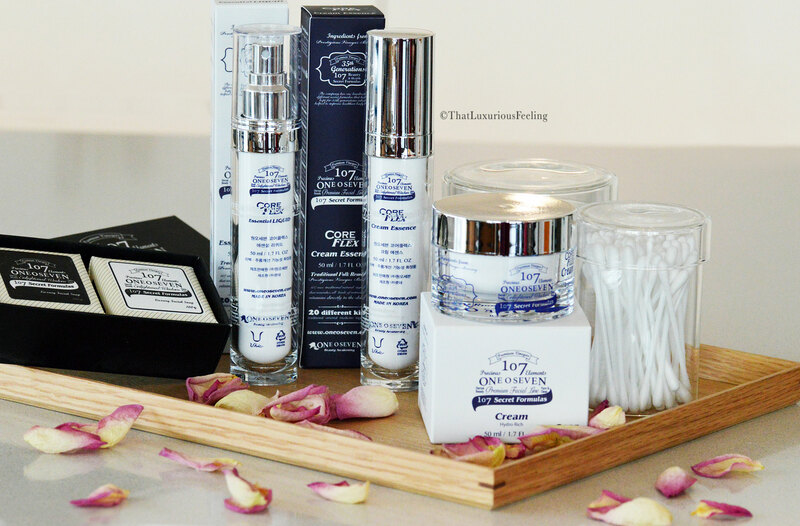 I didn’t know what to expect when I first tried the brand and I had no idea how long it would take to see any visible results as we often say that skincare needs a good 28 days to work its course. Then I met the Coreflex Essential Liquid and Coreflex Cream Essence and the world as I knew it completely vanished. TWO days and nights with this routine and my skin looked transformed. I don’t want to sound dramatic here, but OMG. The clean design of the entire range, with its dark navy lettering on white background speaks to me on so many levels. It is unisex but still feels romanic and chic. 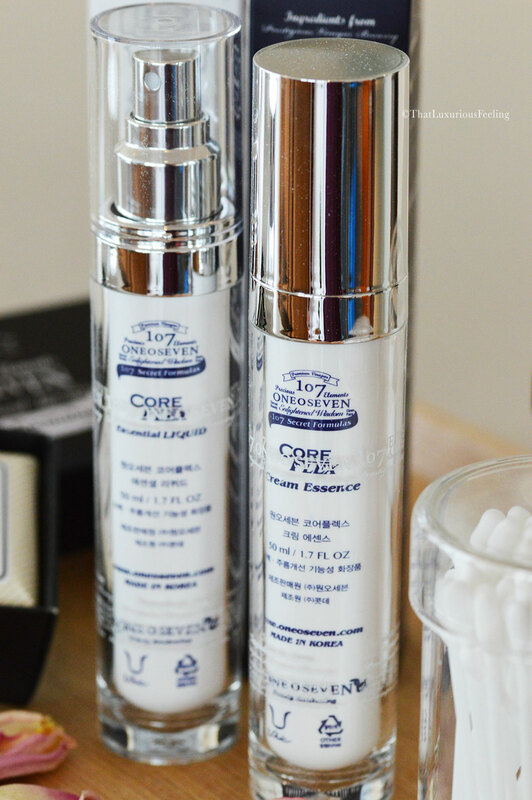 When I first tried the Coreflex Essential Liquid I was surprised! I had no idea it was a facial mist, I thought it would be a liquid serum hahaha. Well, I got over it pretty quickly as I’m a sucker for a good facial spray and this one does its job. The spritz is quite rich and plenty, some might like a finer mist but I really like this version a lot. As with all of the products, Ms. Okran Chung early discovered that all of her vinegars contained 100% naturally formed amino acids – in fact 7 of them – and compared to chemically synthesized versions of amino acids, these comes with a much higher absorption ratio. Perfect for my dehydrated skin. Filled with wonderful key ingredients like aspergillus/saccharomyces/rice ferment filtrate , arbutin, adenosine, and lactobacillus/soymilk ferment filtrate, this delicate mist is hydrating, softening and anti-ageing. Just a couple of spritzes over the face and neck gives an instant effect of radiance and brightening which is actually noticeable on my dull complexion. I wouldn’t say it can fix all of my hyperpigmentation but it definitely add clarity to the skin. Some might find the scent a too strong; it is intensely floral and fresh. 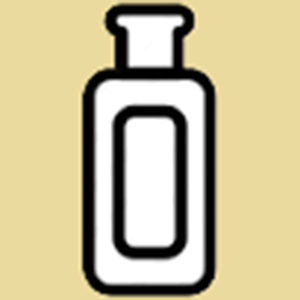 No trace of vinegar-smell but still, if you like your skincare to be scent-free you might take notice of this. Being a firm believer in the power of scents, I personally adore the smell of this mist! The second “twin” is what makes the entire routine GROUNDBREAKING: the application of Coreflex Cream Essence is like entering skincare paradise. Do keep in mind that I’m not paid to say this – I’m obsessed! Based on the key ingredient of 7-year old aged fermented vinegar this liquid serum-cream is set to provide a powerful tightening and brightening effect to your skin. With seven Amino acids as well as Squalene it assists with prevention of UV-damages, works on those dark spots and promotes cellular growth. Hands down one of my favourite skincare ingredients ever. Also equipped with some gentle Retinyl Palmitate – derivative of popular anti-ageing ingredient Vitamin A – it assist in skins cell-communication which is crucial to achieve elastin and collagen production. This light, silky liquid sinks into the skin in an effortless way and what makes it such a winner in my book is that it actually manages to make my enlarged pores on my nose look smaller and less prominent. I always struggle with these (to keep them clean and at the same time tighten the look of them). This cream essence just fixes the problem! The scent is clean, fresh and delightful, as well as the texture which screams of luxury. I will never be without this product ever again. To seal in the mist and the cream liquid essence, the final step of the 107 ONEOSEVEN routine is their Coreflex Hydro Rich Cream. And we are talking super-rich! 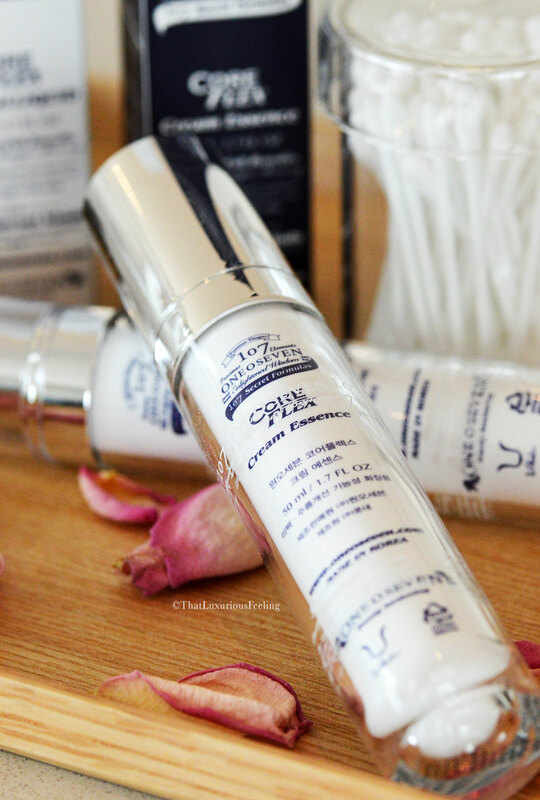 For someone like me who happen to LOVE the dense, rich and thick original Creme de La Mer by La Mer, it comes as no surprise that the Coreflex Hydro Rich Cream will fit the scope. Claimed to provide super rich hydration, plumping and radiance while being highly softening and nourishing, this cream is heavenly. I prefer to use the entire routine at nighttime as I enjoy sleeping in it and waking up to a new-and-improved me! The cream features Moroheiya which has Hyalurone B in it. This calms the skin while it delivers rich hydration. Also enriched with Squalene, natural Sunflower Seed Oil, Fermented Vinegar, Amino Acids, Red Ginseng, Pomegranate, Soy Milk ingredients and Niacinamide it is a star-lineup to make sure that we get the most nourishing and hydrating cream. I know it can be used both for day and nighttime but I’m thinking that some might feel that it is too rich to sit under foundation. It takes a little while for it to sink into the skin but it leaves an impressive result. “I seriously don’t want to wash my face! I don’t want this glow to ever go away”. This from a man who really takes his skincare game seriously. There you go. Two people, different genders, very different skin to begin with and we can definitely agree that in this very case; Korean skincare is pretty darn fabulous. I’ll be more than happy to repurchase from Bemused Korea and to try additional brands that they represent. The experience has been nothing but a treat. Lisa also sent me one of the 107 ONEOSEVEN snow masks, a brightening sheet mask that usually comes in a pack of eight for consistency. I haven’t yet had the chance to try it as I must admit that I tend to prefer spreadable masks on my skin. However, I’ve seen the reviews on this one and they speak for themselves. I’m eager to try it out. Might be the perfect Ramadan Pampering Session I so desperately need right now. PS. I’m also eagerly waiting for ONEOSEVEN to launch new additions to the already exquisite line of products!